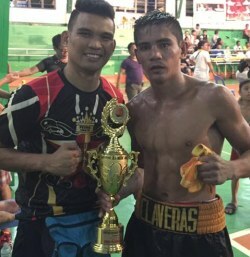 FORMER two-time title-holder Richard “Explosive” Claveras survived a nasty cut to win by a majority decision against Jeronil “El Diamante” Borres for the vacant Oriental Pacific Boxing Federation (OPBF) flyweight crown last Friday night at the Strike Gymnasium in Bacoor City. Noel Haducan and Fernando Batista both scored it in favor of Claveras at 77-76 and 77-75, respectively. Engr. Greg Ortega, president of the Association of Philippine Professional Boxing Referees and Officials (APPBRO), however, saw it a draw at 76-all. Claveras suffered a nasty cut below his left eyebrow from a left hook by Borres in the 5th round. But it did not stop Claveras from chasing his younger opponent in the last three remaining rounds. Borres suffered a slip from a slippery spot near the corner. But Borres was still able to connect with a solid jab. The 27-year old Claveras continued with his attack against Borres, who kept on backpedaling due to the left-right combinations of the former WBC ABC champion and WBC International champion. But the 21-year old Borres countered Claveras with more telling blows in the last three rounds. Borres later fell down on his knees after the ring announcer had announced the unpopular result to the crowd. “Dapat panalo si Borres dahil mas marami siyang suntok na solid,” said trainer Roy Sumile of Highland Boxing Gym from La Trinidad, Benguet. Claveras of Team United improved his record to 32 wins with 10 losses and 3 draws and 15 knockouts while it was only the first defeat suffered by Borres after seven straight wins with one draw. The other title-fight, however, for the vacant OPBF Silver super flyweight title between former OPBF champion Ardin “The Jackal” Diale and undefeated Ryan “Singwangcha” Lumacad ended in a technical draw after the former suffered a deep cut on his left eyebrow. Diale decided not to continue fighting after being asked by ring physician Mario Sing. “Masyado rin kasing malalimang sugat nya,” said Sing. Lumacad was already starting to land his punches against Diale when they accidentally clash their heads in 36 seconds of the fourth round. City Mayor Lani Mercado-Revilla awarded the plaques from the city government while the trophies were turned over by OPBF supervisor Dr. Nasser Cruz. Meanwhile, London Olympic Mark Anthony Barriga continued his second straight win via a convincing unanimous decision against Powell Balaba in an 8-rounder. Unknown Jeven “Mutya” Villacite of Butuan City scored an upset win over WBC Asia Silver flyweight champion Masazumi Furukawa by a UD in their own 8-rounder bout. The other Japanese Sawa Iwai, however, won by a UD over Juan Purisima of General Santos City in a 6-rounder.